Clinical Manager, Assistive Technology Services, ALS Association Greater Philadelphia Chapter and Assistive Technology Consultant to the National ALS Association. The Greater Philadelphia Chapter implemented an innovative Assistive Technology Program in 1993. I have been with the Chapter since 1996 and for the past fourteen years, have seen assistive technology significantly improve the lives of those living with ALS. Technology has continued to change and morph as the years pass and now people with disabilities have many choices that can help them communicate. The information below is to help you have a better understanding of Augmentative Communication and techology. Do you have a question about assistive technology, or need help or guidance? Send an email to Alisa Brownlee, ATP, Assistive Technology Consultant. Electronic communication devices are used by anyone that can not make themselves verbally understood. Many different electronic communication systems are available. Some communication systems are custom designed for a specific user or can only be used in specific situations. For example, a communication system that works through a desktop computer cannot travel with the patient to doctor visits, but a laptop or notebook computer is more portable and will allow the patient to travel with the system. For more sophisticated computer access there are several “eye gaze” computer systems on the market. These high priced specialty computers relay strictly on eye movement for activation. This type of machine is only used by people that have little or no muscle movement left on their bodies. 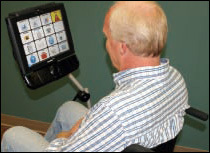 In order to use eye gaze systems, the user had to remain still in order to use this computer. The basic premise is that a CCTV camera is placed below a computer monitor. The camera tracks your retina movement. Special software is loaded into the computer and allows the user to have full access by simply moving their eyes around the screen. This equipment ranges around $10,000-$25,000.00 There are some drawbacks though—most of the systems can’t function in natural light so the individual must live/work with shades down and minimum natural light. Producers of eye gaze systems are DynaVox (www.dyanvoxsys.com) Prentke Romich Company, (www.prentrom.com) Quick Glance ( www.eyetech.com), My Tobii at http://www.assistivetech.com/, and LC Technologies (www.lctech.com). Eye gaze users can do email, internet, phone use, etc. In the past, communication devices were not a covered item under insurance policies. In 2001, Medicare announced they would cover of cost of these devices. After that, most private insurances followed suit. Electronic AAC devices range in price from $4,000-$10,000 with the average being around $7,000. Most private insurances will only pay 80% of that cost leaving a 20% co-pay for families. Not everyone gets a communication device because of insurance issues or the fact that they might not be interested in using a device. There are also psychological issues surrounding the use of communication and or adaptative devices. In a survey done in the 90's, researchers found that people equated the severity of a disability to the "visual ness" of the disability. Meaning those with low vision didn't' want to use a white stick because it proclaimed to the world "I am blind". Same goes with people using a computer or communication device to speak. If it looks abnormal, they tend to shy away from it. However, if it looks mainstream, they tend to accept it more. Ideally, we want to keep our PALS using mainstream technology so Netbooks, smaller laptops, Palm Pilots, and iPhones/iPads are popular within our community. It may be a short term use, because we are dealing with a progressive disorder, but for those few months our PALS are quite happy and enjoying the technology.